Mitral Regurgitation impacts millions of adults in the United States and if left untreated, can be life-threatening. Mitral regurgitation occurs when the mitral valve leaflets do not close completely and blood flows backward or “leaks,” creating symptoms that may include shortness of breath, fatigue and chest pain. The cause can be Degenerative or Functional. MitraClip is performed through a vessel in the groin using a catheter. Please watch the short video below for more information. 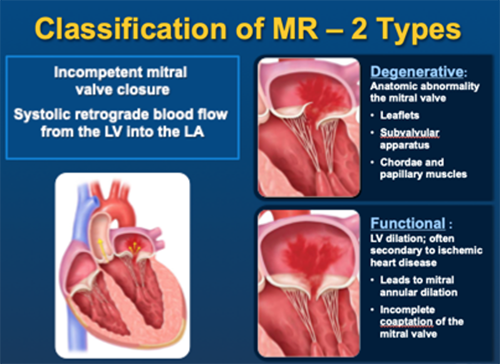 Severe, mitral regurgitation is often treated with open-heart valve surgery. However, for high-risk patients, open-heart surgery may not be the best treatment option. For these patients, MitraClip is the only approved minimally invasive, non-surgical treatment option. During a MitraClip procedure, the MitraClip device is inserted in to the body through a catheter placed in the patient’s femoral (leg) vein. The catheter is then threaded up the vein to the heart. 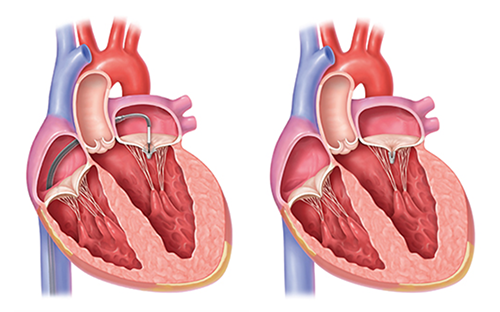 Once in the heart, a small hole is made in an internal wall of the heart (the atrial septum) and the MitraClip device is advanced across the mitral valve. The device is positioned and placed to join or “clip” together a portion of the mitral valve leaflets, reducing or eliminating the backward flow of blood. Patients typically go home the next day. The best candidates for the FDA-approved usage of the MitraClip are either patients who have Degenerative or Functional Mitral Regurgitation.